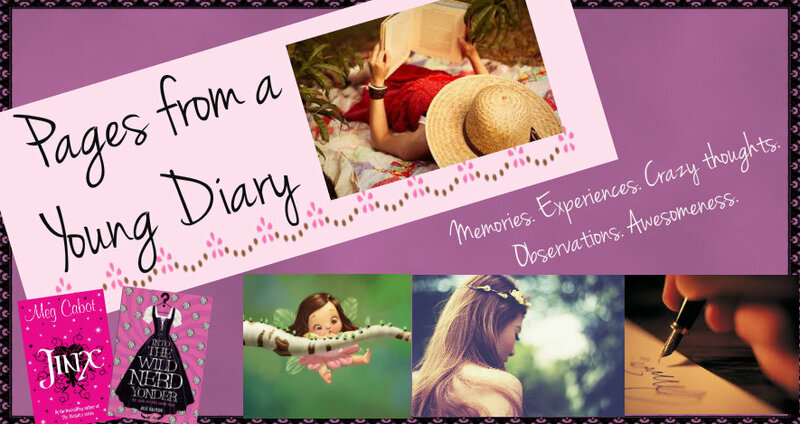 Pages from a Young Diary: The Scooty Story! Another random post. I should just change my name to Ashna-Random-Banga. See what it looks like! ;) Gorgeous much? 2. There are a lot of family memories associated with Scoot too! One such memory that's the mother-of-all-memories is the time when I lovingly put on my helmet on grandma's head to see how she looked and then I asked her to sit once on Scoot too, which she refused because she didn't want to go outside in the verandah and doing such kiddish stuff. :P But then my dad went, 'Oh. If you don't want to go outside, we'll get Scoot inside!' Off he went and brought in Scoot, inside the drawing room. 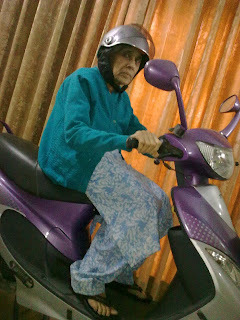 While we were laughing with glee and excitement, my lovely, sporty and graceful grandma posed on Scoot as if she's riding it. :D I'm putting in a picture! That one, we can never forget. 3. Scoot used to be quite faithful, too. When I "forgot" to get in enough petrol, it never betrayed me and I always reached home safe and sound even when I checked the tank where I saw just a few dregs of petrol at the bottom. When it gave me a flat tyre, it made sure to do it in the metro parking, where a repair mechanic sat right next to it and did not give away right in the middle of the main road. I'm thankful for all those times when it allowed me to take it over all horrible kinds of rough surfaces, though most of the times I avoided those, but still. I'm glad it never gave away! Now, I used the past tense for Scoot being faithful, because it hasn't been much lately. I've been stranded thrice on the main road whenever my speed became too low and it stopped! As the self-start doesn't work anymore, imagine my horror, because I had to drag it to the side, amid the huge bulk of scary traffic and kick-start it. (Just so you know, I'm awesome at kicks) And this happened on the same day. In one trip! 4. I suppose my brain got a hate-spot for Scoot after that because once, a few months ago while coming back from college, I took a rickshaw and went back home. It was late evening when dad came home and asked, 'Hey, where's Scoot? I didn't see it outside.' That brought my heart straight to my mouth! I forgot Scoot in the metro parking! :P I actually forgot I had Scoot in the parking, that I had used it to travel! *Bangs head on a hundred walls* Then I pleaded with dad to bring it back as I could not imagine it all alone in the parking. God knows some aatma might have invaded it and then that very same aatma came into me? I'm already full with my own soul, thank you very much. I forgot Scoot in some other parking one more time. That was last week I suppose. I'll sue my brain for such hate and carelessness someday. I used to frown on materialistic stuff. I thought they could never be a source of deep happiness. Scoot proved me wrong, and instead of hating it for that, I love it all the more! ^_^ Do you have someone like Scoot in your life? :D Thanks! A million hugs to you too! This was a lovely random post. Absolute fun. You know, I could picture the whole post like, short-films playing in front of me. :D The cow one was specially so you(in a good sense of-course :P). And that forgetting keys in the keyhole thing has happened with me so many times that I've forgotten even the count. I used to forget keys in the bike/scooty almost every second time I parked it outside my house for short periods. And I've had my share of lectures. The cow one was so me? Haha! Right! I even had a nightmare about a huge cow once, yikes! You forget the keys so many times? :O I'm SO happy! I almost feel I'm quite sensible and careful :P Thanks for making me feel that way! btw this name change feels like gender change! I share the same thoughts as you... on my flyte.. Yeah its not scooty its Sym flyte and I call it Gulabo for its colour. Dare anyone poke fun of it or try acting wacky... I cannot stand it at all! !